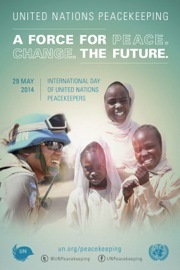 May 29 marks the International Day of United Nations Peacekeepers, established by the UN General Assembly in 2002. This day of observance serves two chief purposes: To honor the memory of UN peacekeepers who have lost their lives while serving – more than 3,200, including 106 women and men in 2013; and to salute the more than 111,000 peacekeepers serving in 17 missions today. Sixty-six years ago, on May 29, 1948, the United Nations Security Council called for a cessation of hostilities in Palestine and for UN mediators to supervise the truce with the assistance of military observers. The United Nations Truce Supervision Organization (UNTSO) soon arrived in the region – the first of sixty-nine peacekeeping operations launched across the globe by the UN to date. The UN Office of the Special Advisor on the Prevention of Genocide (OSAPG) recognizes that peacekeepers can play an important role in preventing genocide and mass atrocities, especially when deployed during the early stages of a conflict. In their Analysis Framework, OSAPG highlights the “presence of international actors such as UN operations capable of protecting vulnerable groups” among factors that can affect the capacity to prevent genocide. Every year, OSAPG officials share this framework with participants of the Auschwitz Institute’s Raphael Lemkin Seminar for Genocide Prevention.